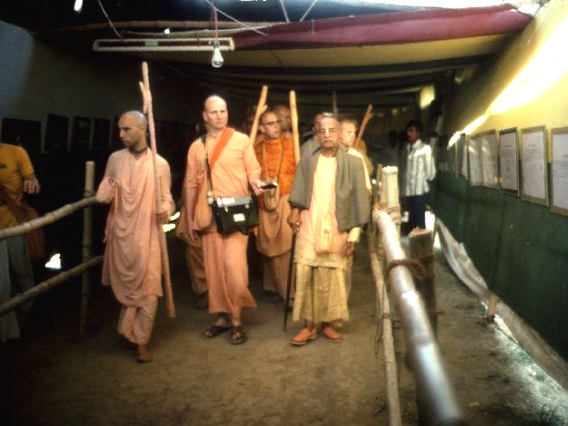 Hari Sauri : On March 12, 1976, in Mayapur, Srila Prabhupada visited the newly erected public exhibition and saw some of the displays. The presentation of so many international projects was impressive. Prabhupada suggested that a book be published showing all the temples and Deities around the world, with a short explanation of each. He said this would be good for preaching work. However, the structure built to house the exhibit is terrible. It is constructed along the banks of the pukkur from bamboo, dirty old tarpaulin sheets, and crudely woven, split-bamboo fencing. Access is poor, up a slippery mud slope. It compelled Srila Prabhupada to complain about the management.